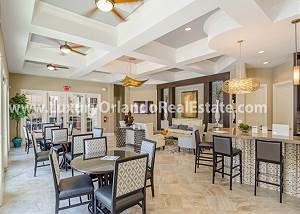 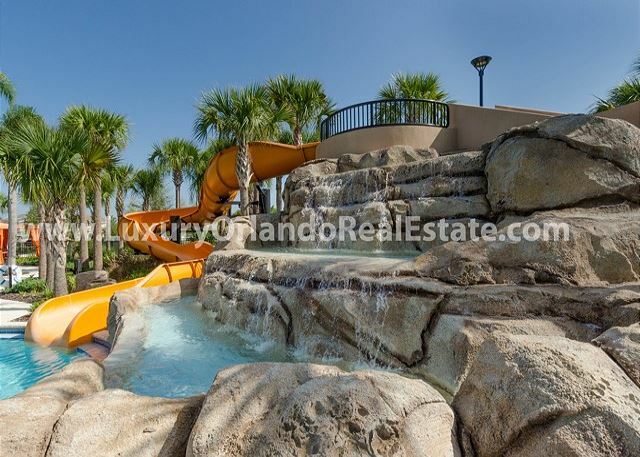 3 Kings, 1 Queen, 2 Twins, 1 Bunk (Twin Over Full) This Brand New 6 bedroom 5 bath home in the Solterra Resort Community is now ready for rentals! 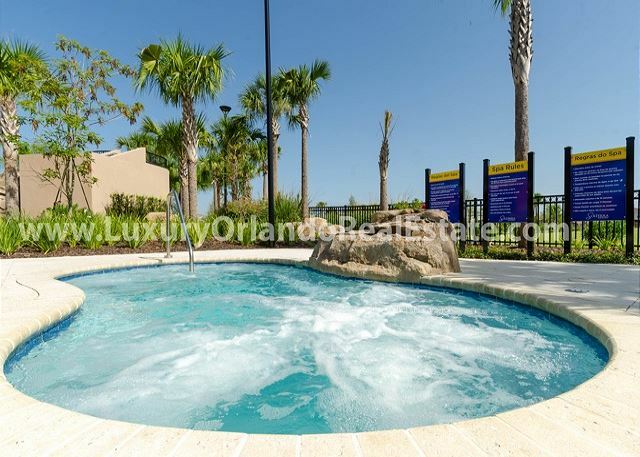 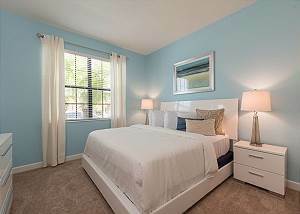 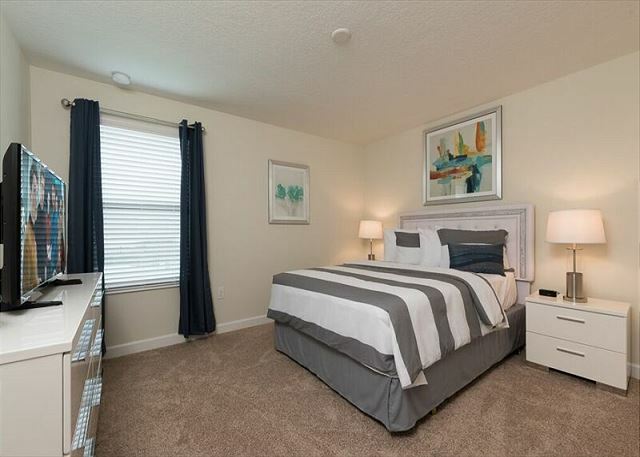 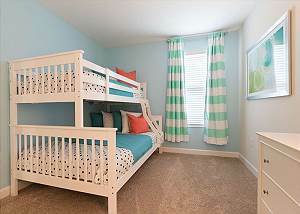 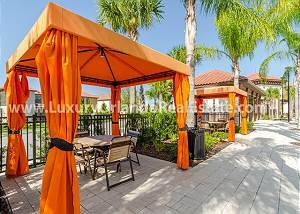 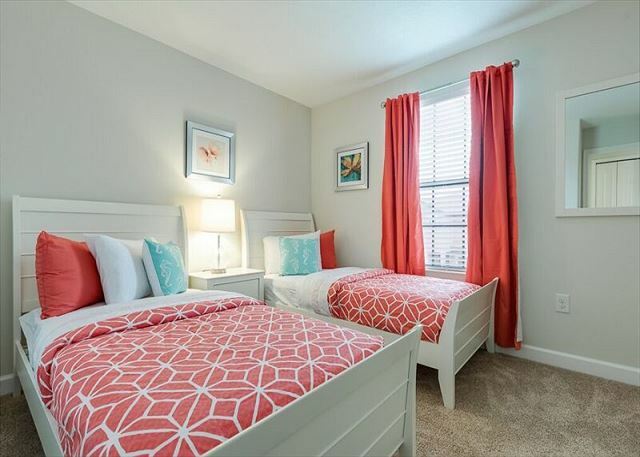 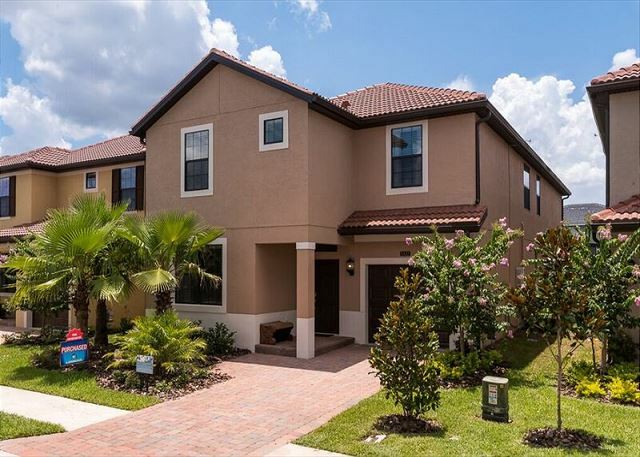 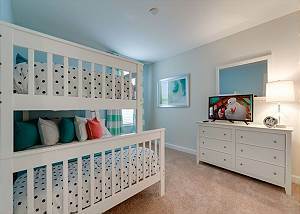 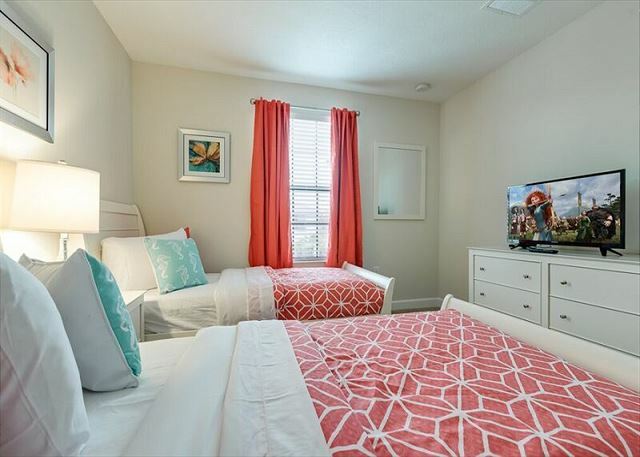 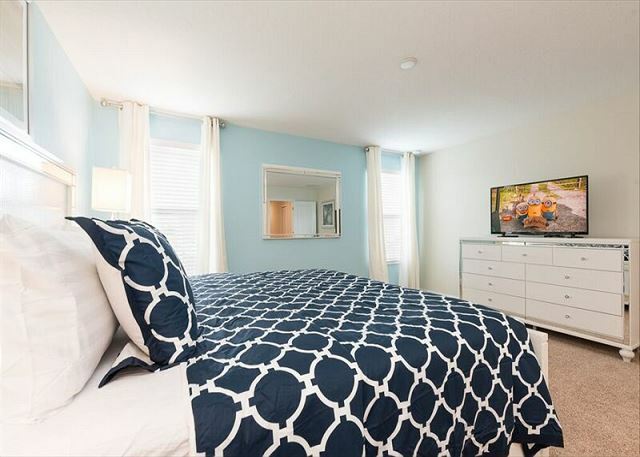 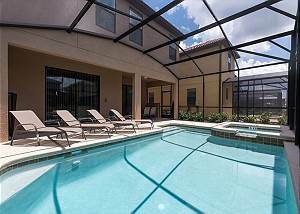 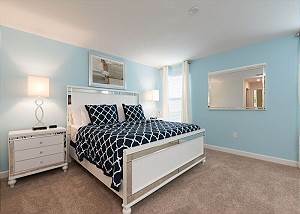 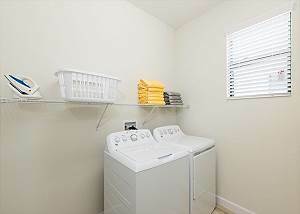 This community is just minutes from theme parks and all major attractions. 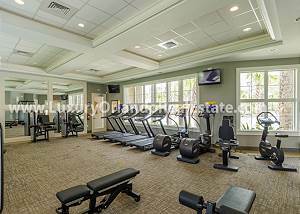 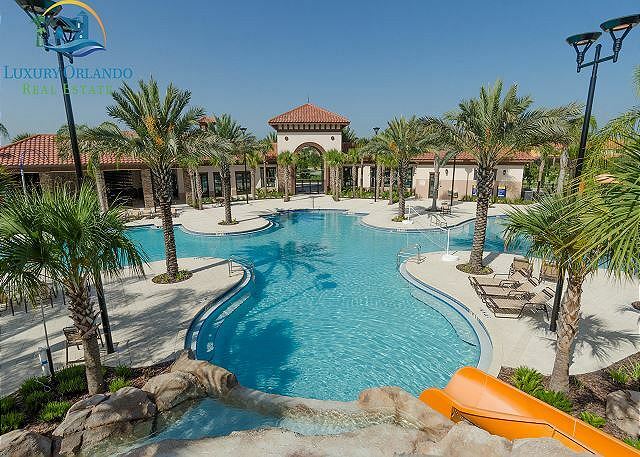 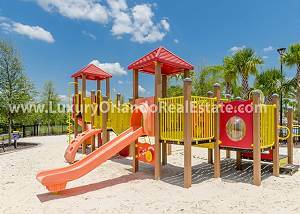 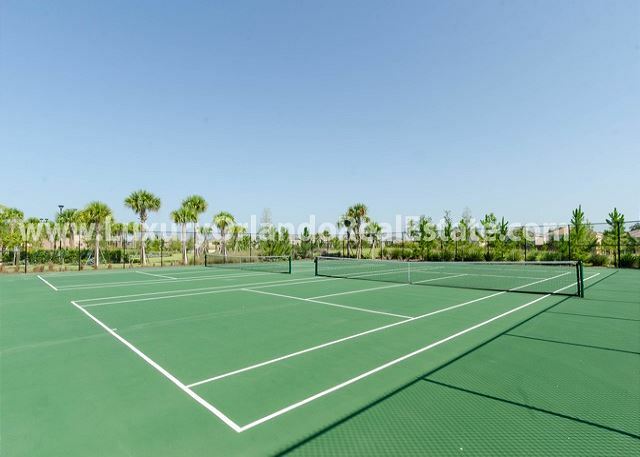 The resort has lots to offer including a state of the art Clubhouse, huge resort pool, tennis and volleyball courts and even a children's playground area. A brand new lazy river and clubhouse restaurant will be finished and available soon as well. 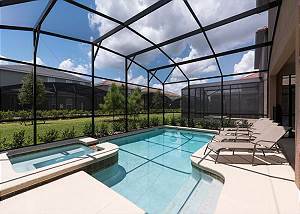 Don't delay as this home will book quickly. 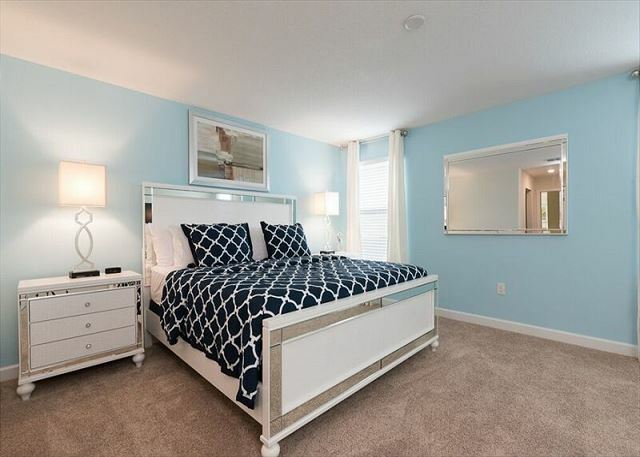 This fantastic home has one king bedroom downstairs with the upstairs consisting of 2 king bedrooms, one queen bedroom, 1 bedroom with 2 twin beds and a bunk bed twin over full beds. Each bedroom has its own flat screen TV as well. 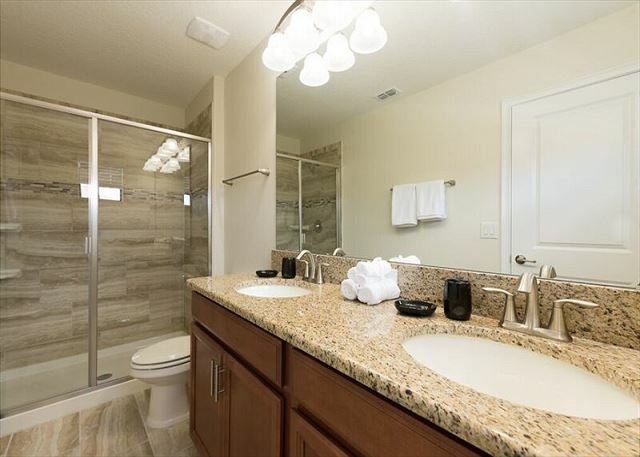 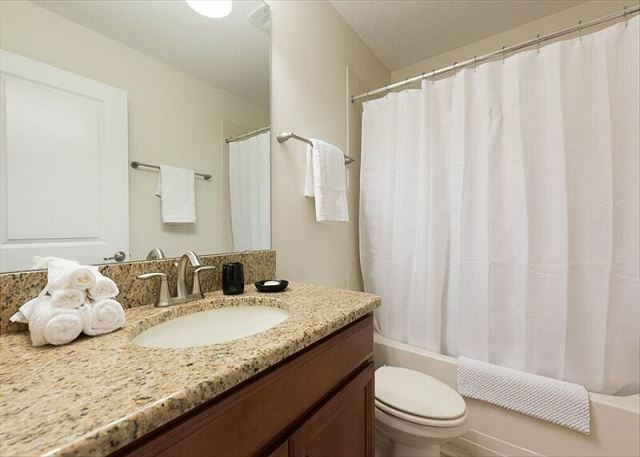 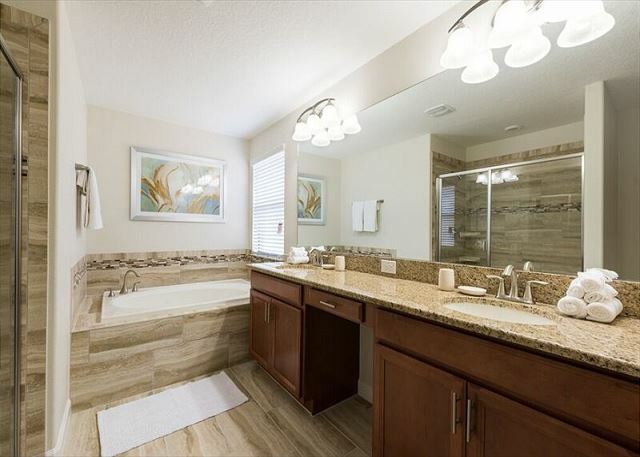 Check out the master bathroom downstairs with the luxury garden tub and huge walk-in shower. 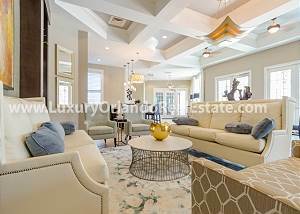 The home has 2 living areas for your group. 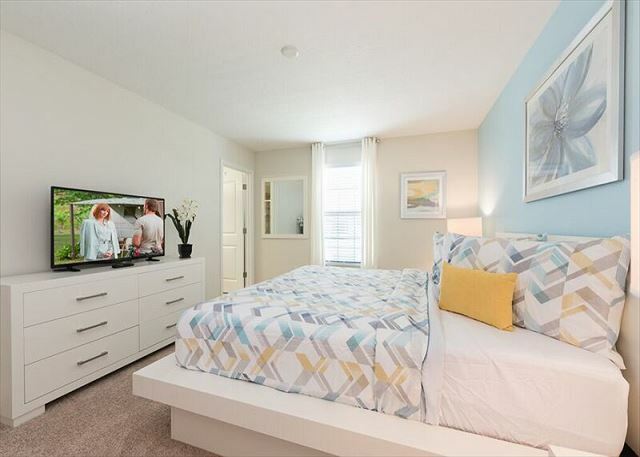 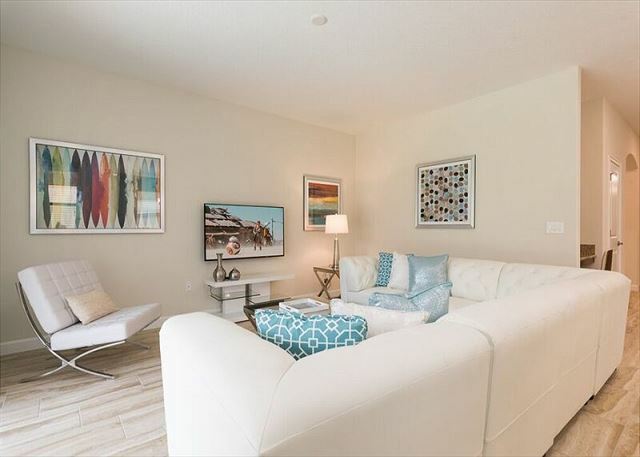 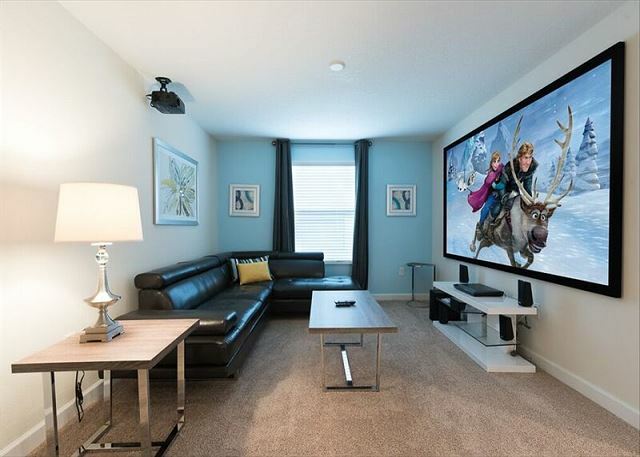 A large open concept living area downstairs to gather the family and another living room area upstairs with an enormous 100 inch movie screen and projector, perfect for watching your favorite movies after a long day at the parks! 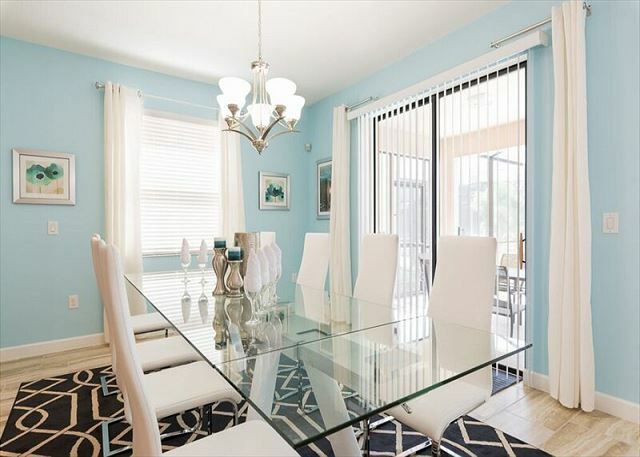 A beautiful dining area with seating for 8 and a large fully equipped kitchen with granite counter-tops, brand new stainless steel appliances and gorgeous cabinets. 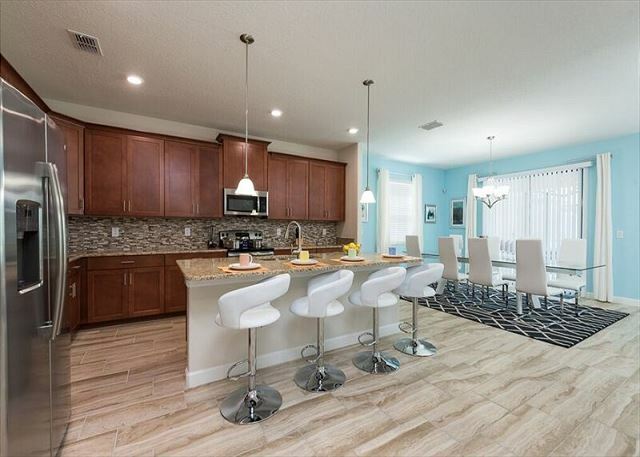 You'll definitely love the backsplash too! 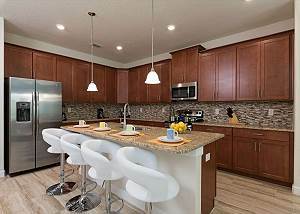 The breakfast bar at the kitchen Island has seating for 4 more guests. 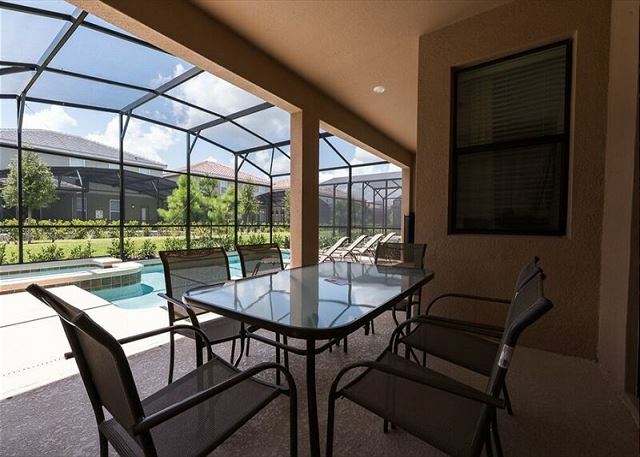 The outside area has a covered patio overlooking the large fully screened-in pool equipped with a safety fence. 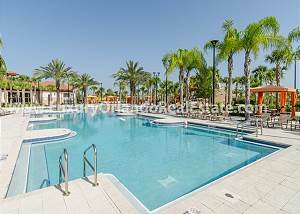 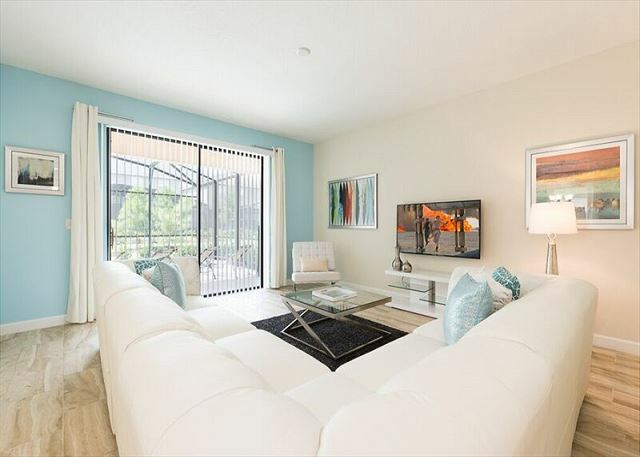 Ample seating and sun lounge chairs are available to soak up the warm Florida sunshine. 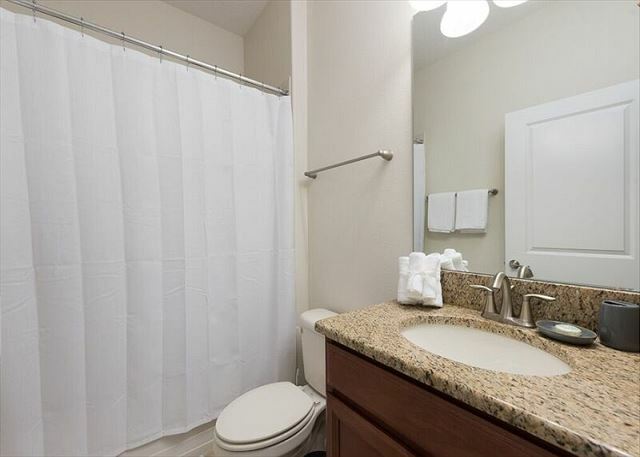 Take a dip in the private pool or soak in the spill over spa. 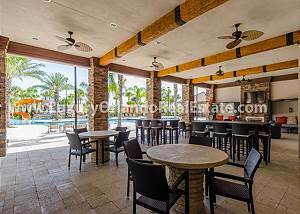 (Please ask about adding Pool/Spa heat to your vacation rental) Spend time in the game room with a professional grade pool table or sit at the bar top table and chairs watching the family play. 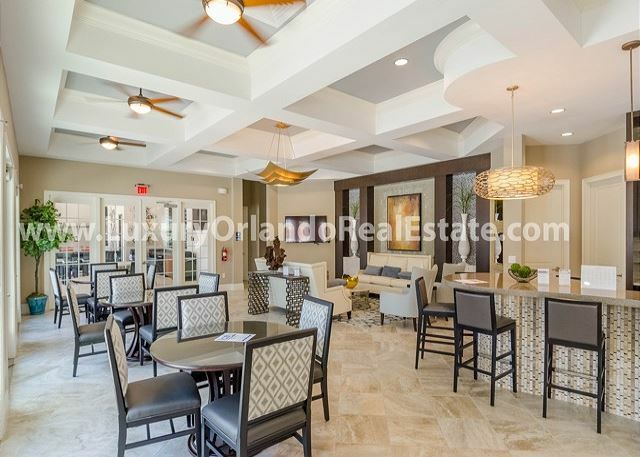 This home is very close to the Solterra resort clubhouse and only a few minutes walk.